NL3106 Flexsteel Futura with new Futurin cover resists cracks, fading, abrasion and petroleum based fluids and is designed to dispense a wide range of fuels with extreme durability. 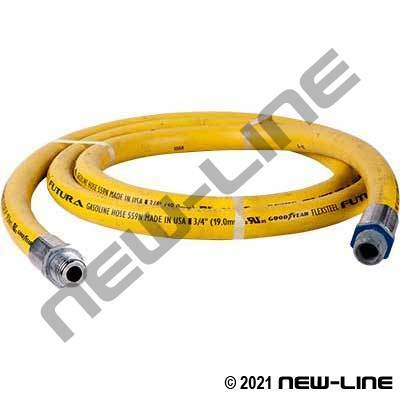 It is a popular gas station hose that will handle unleaded and leaded gasoline, oil, and other petroleum based products (including E85 & Biodiesel blends up to B20). It is ULC listed for use on gasoline dispensing pumps or reel-type pumps. Its wire braid reinforcement provides excellent kink and crush resistance, low computer creep, and long service life. Popular assemblies are listed below and any 'non-stock' assemblies can be made up from our bulk inventory. For assemblies with crimped FuelGrip fittings, please use '-153' as a suffix for solid x swivel ends and '- 152' for solid x solid ends (for marine applications only use solid x solid ends). FuelGrip fittings feature a special live swivel that does not have a traditional "C" clip which is found on the chrome fittings. Retail boxes for assemblies are available (Part # CSB-18x18x2). New 2013: As of January 1, 2013 Underwriter's Laboratory requires all fuel dispensing hose assemblies to be assembled by UL certified & approved supplier, which includes using UL Recognized hose, UL marked fittings & test every assembly per UL Listed requirements. Typical Fittings: N98/N99 chrome curb pump fittings (low pressure/gravity only, suffix -150 for solid x solid or 151 for solid x swivel) or crimped N93/N94 FuelGrip ends (-152 & -153), testing & certification. Construction: Tube: Smooth, black, high quality nitrile rubber. Cover: Smooth, yellow Futurin/nitrile blend. Reinforcement: High tensile wire braid.